The Crystal Palace in London is destroyed by fire. 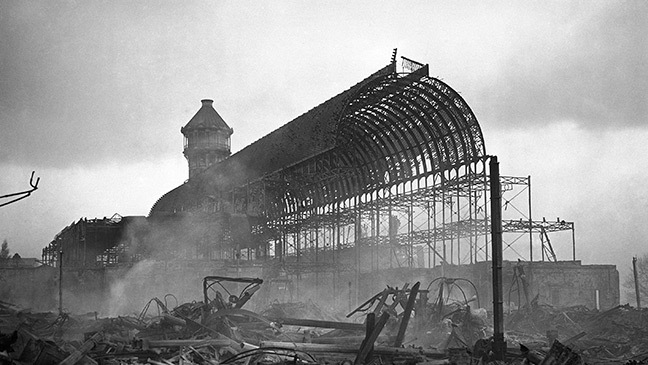 On November 30, 1936, the Crystal Palace, an iconic structure which had come to epitomise the pomp of the Victorian era, was destroyed by one of the greatest fires ever seen in London. The 990,000 square foot cast iron and plate glass building was constructed in Hyde Park for the Great Exhibition in 1851, at the behest of the Queen’s husband Prince Albert. In 1854 it was redesigned and reconstructed on Penge Common, by Sydenham Hill in South East London. At just after 7pm on the evening of November 30 the Palace’s manager, Sir Henry Buckland, was walking in the grounds of the building when he saw a red glow emanating from it. He found two nightwatchmen trying to douse a fire that had begun in the women’s cloakroom and spread to the central transept. The blaze took hold with alarming speed as the flames, helped by a strong wind, swept across the Palace’s acres of timber flooring, up into galleries and along glazing bars. The Penge Fire Brigade was not called until nearly 8pm; by that time, the building was an inferno. "We are like tea bags - we don't know man lying on sidewalk as people pass by our own strength until we're in hot water." This entry was posted in Uncategorized and tagged 1936, 30 November by Admin2. Bookmark the permalink.